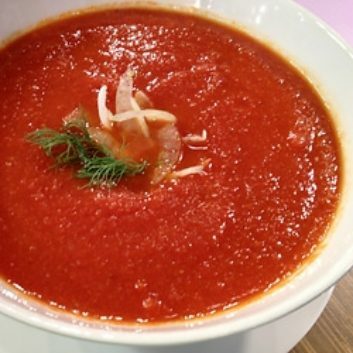 Slurp up a bowl of this delicious soup. It has fantastic flavor – and its made with low-cal nonstarchy veggies and seasonings, so if you want a second bowl, go for it. Bonus: cooked tomatoes are loaded with a cancer-fighting antioxidant called lycopene! Preheat the oven to 425 degrees. Line 2 non-stick baking trays with tomatoes (cut side down), garlic, and onion. Coat lightly with oil spray. Cover generously with freshly ground black pepper, onion powder and garlic powder. Lightly sprinkle with sea salt. Place baking trays in oven and cook for about 25 minutes. Add chicken broth to a large pan on top of the stove and bring to a boil, then add the contents of the baking sheets. Turn off the stove and allow mixture to cool for about 2 minutes. Purée everything together by either using an immersion blender, or pouring batches in a blender until no chunks exist.